We'd all love to be able to predict earthquakes ahead of time — just think of the lives that could be saved. 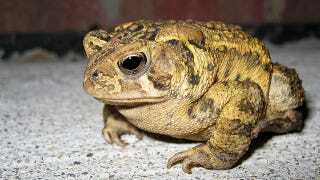 But toads can spot subtle changes in water chemistry before quakes way better than any scientist. When a team of researchers from the Open University, Uk, saw a colony of toads completely abandon its pond in L'Aquila, Italy, in 2009, they thought something was strange. Then, when an earthquake arrived, their curiosity was piqued, reports the BBC. In stepped Friedemann Freund from NASA, who had been studying the chemical changes that occur when rocks are under extreme stress — just like before a quake hits. Those stresses can cause the Earth's crust to release charged particles, which in turn react with the groundwater sometimes creating hydrogen peroxide along the way. Because animals that live in groundwater are sensitive to changes in its chemistry, they can detect these small changes, which can indicate the occurrence of an earthquake up to days in advance. It's not the first time animals have been observed predicting earthquakes. In 1975, in Haicheng, China, snakes were spotted emerging from burrows a month before the city was hit by a large earthquake. What was weird about that was that the snakes were in the middle of their annual hibernation and temperatures were well below freezing – unlikely to usually tempt a snake out to play. But previously all the evidence surrounding these predictions has been anecdotal. Now, between the Open University and NASA, they've figured out exactly how the water changes and why it affects the amphibians. While there's no doubting that the team have shown why the toads react to the future quake, the biggest question remains how we can use that knowledge to help predict them ourselves.